Host 1 or a Series of 5! Meet Freddie the Frog® puppet. Read interactive story with audio playing. Introduce and demonstrate Internet games and iPad app. Coloring pages to send home. Announce and invite to the next reading event. Event details: Step 1. Ask students to sit on the floor facing adult leader. Clap a short rhythm pattern; wait for children to echo. Repeat a few times with different rhythm patterns. SAY: Freddie loves games. One of his favorite games is the mirror game. SAY: I'm looking in my mirror and you are my giant mirror. Begin with simultaneous movement of both hands/arms. Move slowly enough that the whole room can move with you, mirroring your actions. STOP AND SAY: Great job! Now, the game begins. The better you do, the harder I will try to make it. I'm going to try to fool you. Continue playing adding silly and scary faces for the kids to mirror. Gradually increase the speed of movement or unique movements to "fool" the kids. End by mirroring bring hands slowly down and folded in their laps. Step 4. Meet Freddie the Frog. Freddie is happy and asks the kids if they would sing it every time they come to a reading event with Freddie. Freddie wants to tell them a story. Would they like to hear about the day Freddie met his best friend? Direct students to use two finger taps with the indicated thumps of 4 quarter notes. Step 6. Sing and beat movement to "Eli's Hokey Pokey" recording. Ask students to stand, placing their feet where their bottom was. Instruct students in making an elephant trunk and elephant ears using their arms. Move to the beat of the music. "Turn yourself around" elephant – style, wide and slow, stepping to the beat. Step 7. Sing and beat movement with "Froggie Went A-Courtin'"
Play “Froggie Went A-Courtin’” and ask students to tap the beat, mirroring your tapping. Change where you are tapping on your body, or body movement throughout the song. Switch tapping locations every eight beats. If time allows, ask kids to sit where their feet are, and add classroom instruments. Distribute a different classroom instrument to every other child. Play the beat for eight counts then pass to the student on the left. Continue. Transition: Ask students to sit where their feet are. Step 9. Coloring pages to send home. Step 10. Announce and invite to the next reading event (printed on the back side of the coloring page). Step 11. Optional Make-And-Take Instrument Time (invite parents/care provider to help their child). Demonstrate the steps of making a tambourine as described below while everyone is still in seated and listening position. Direct kids and grownups to “stations” to work on making their instrument. Staple or glue two paper plates together, facing each other. Cover the staples with tape. Using a hole punch, make holes around the plates and tie jingle bells to the holes with string. Decorate the tambourine with crayons. Stand, turn in direction of the line and leave to give Freddie a hug and return to their parents/care provider. 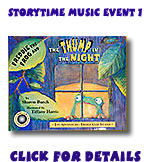 Next reading event, share Freddie the Frog® and the Mysterious Wahooooo book/CD, note name review, and follow up singing and movement. SAY: I’m looking in my mirror and you are my giant mirror. Step 4. Ask students to "do their job" so they can sing to Freddie the Frog. Wait for students to sit quietly, hands to themselves, to show Freddie that they are ready. If students are wiggly and not listening, pretend that Freddie is a little scared and sad. He thinks that they do not want to sing his song. When students are ready, THEN sing, "Hello, Freddie." Transition: SAY, Raise your hand if you have ever had a scary dream. SAY, Aren’t you glad that scary dreams are not real?! SAY, Would you like to hear about Freddie’s scary dream? Boy, was he glad it was not real. SAY: Freddie was SO GLAD that was only a dream, and it was not real. SAY: Hey! Do you want to sing one of Freddie’s favorite songs? Step 6. Sing and beat movement to "Hop-N-Flop Shuffle" recording. Model for students to mirror you during the song. Pretend to strum to the beat during the first verse. 2nd verse: Instruct students in making elephant ears using their arms. Bend their knees and flap their ears to the beat. Repeat of the chorus: Air guitar. ON THE LAST NOTE, YELL OUT: Go down on one knee like a rock star! Ask children to raise their hand if they think they know the tune. Remind them to not yell it out. Pretend Freddie hums into your ear, and then you hum to the audience. Hum the tune to "Twinkle, Twinkle, Little Star." Choose a child to answer. Any of these three are correct answers: "Twinkle, Twinkle"; "ABC Song"; "Baa, baa, Black Sheep"
Ask the kids to sing whatever answer was given. Freddie indicates the game is not over. Hum the same tune again. Keep going until the children guess the "ABC Song." When the children sing "The ABC Song" pretend Freddie is yelling at you at the letter "H."
Stop the singing and ask what is wrong. Freddie tells you that on Treble Clef Island there are only seven letters in his alphabet. Freddie wants to know if the kids would sing HIS alphabet. PLAY: AUDIO track "The Musical Alphabet – Reggae"
Ask students to put a fist in the air as they sing each letter. Alternate arms. Add "conga rolls" in between for an extra challenge and to keep older kids engaged. Step 11. Optional Make-And-Take Instrument (invite parents/care provider to help their child). Demonstrate the steps of making an instrument as described below while everyone is still in seated and listening position. Use two small plastic cups, or small, short water bottles to make the maracas. Tear or cut small pieces of colored tissue paper. Paint a coat of diluted glue on the cups or bottle. Place small pieces of colored tissue paper on the glue and allow time to dry. 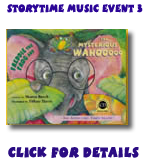 If doing a series of reading events with the same children, do steps 1-4 at the end of the Mysterious Wahooooo reading event; steps 5-8 at the end of the Bass Clef Monster reading event. Carefully fill the small water bottle or one small plastic cup approximately half full with rice. Screw on the lid of the water bottle. If using two plastic cups, place the second cup upside down on top of the first cup with rice to create a “lid,” rim to rim. Use colored masking tape to seal. Paint a second coat of diluted glue over the tissue paper to seal. Let dry. Shake to the beat and enjoy. 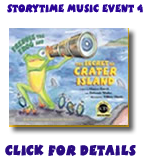 Next reading event, share Freddie the Frog® and the Secret of Crater Island book/CD, note name review, and follow up singing and movement. Step 1. Ask students to sit on the floor facing adult leader. Set Freddie near the audio source to "prepare the music." Show students a shaker/small maraca and a pair of rhythm sticks. Instruct half of the class to come to the front of the room and sit in rows close to your "reading time" chair. Half of the students sit in short rows facing the teacher on the left; other half, on the right. Half of the students in front of your right side will play the beat with rhythm sticks (Eli's part). Other half of the students in front of your left side will play the rhythm pattern with shakers (Freddie’s part). Once the students are sitting in front of you, demonstrate how to play the rhythm sticks to the right half. Distribute to those who are "doing their job." Ask, "What happens if you forget to do your job?" (Wait for the kids to say, "Take them away.") Agree and distribute. If a student “forgets” and is playing when not asked or doing something they should not, quietly, take them away. After a little bit, ask if they can do their job, and give them back. Continue the pattern with consistency, and they will handle their instruments as instructed. Practice establishing and playing the beat. Practice the cue to stop playing and listen. Repeat the process with the other half of the students, demonstrating how to play the rhythm pattern with shakers (Freddie's part). 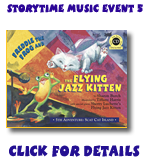 Play the audio and turn the pages, cue students when to play/stop their instruments along with Freddie and Eli as directed above. Step 6. Sing and beat movement to "Tempo Island Conga" recording. Follow the directions in the words of the song. Ask students to stand with their instruments, placing their feet where their bottom was. Lead a conga line with instruments. At the end of the song, lead the conga line so kids are back where they originally were seated. Lead them by a basket or instrument tub for kids to return their instruments on their way back to their seat. Step 7. Create, chant, and tap rhythm patterns. SAY: Let's chant and tap ____________'s new rhythm pattern like Freddie and his friends chanted in the book. Play the "Andante" track and chant and tap the rhythm pattern together, repeating until a new child creates a new rhythm pattern. After several children have a chance to create a rhythm pattern, transition to the next step. If doing this activity in one reading event, do steps 1-4 at the beginning of the reading event, prior to the games and story time to allow glue to dry. Screw on the lid of the water bottle. If using two plastic cups, place the second cup upside down on top of the first cup with rice to create a "lid," rim to rim. 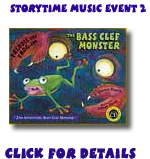 Next reading event, share Freddie the Frog® and the Bass Clef Monster book/CD, note name review, and follow up singing and movement.